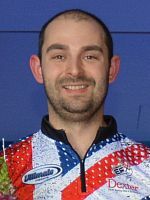 Dom Barrett of England celebrated a last-minute victory in the title match of the 14th Brunswick Euro Challenge to win the season-opening event of the 2017 World Bowling Tour Sunday at Dream-Bowl Palace in Unterföhring in suburban Munich, Germany. Barrett (right), who earned the No. 1 seed for the three-player stepladder finals in the last game of round robin match play, defeated No. 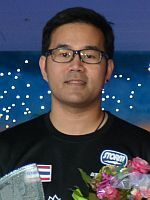 2 seed, Yannaphon Larp-apharat of Thailand, 237-221, to claim his 13th European Bowling Tour title as well as his fifth PBA title. Barrett started the championship match with two strikes and two single-pin spares for a 13-pin lead after four frames as Yannaphon (left) opened in his third frame. The Thai rebounded with five consecutive strikes to lead by five pins heading into the last frame. Finishing first Yannaphon left a split which he was unable to convert to leave the door open for Barrett. The winner of the 2013 PBA World Championship struck on his first ball in the 10th frame to seal the victory. In the semi-final match, Yannaphon survived a close encounter against England’s first PBA champion, Stuart Williams (right), who was looking for his seventh EBT title and the second PBA title. After a 204-204 tie, Yannaphon struck on his first shot, while Williams left a 10-pin standing for a 10-9 win in the tie-breaker. Barrett walked away with the 11.400 Euro top prize. Yannaphon took home 8.500 Euro for second place and Williams received 5.500 Euro for third place. 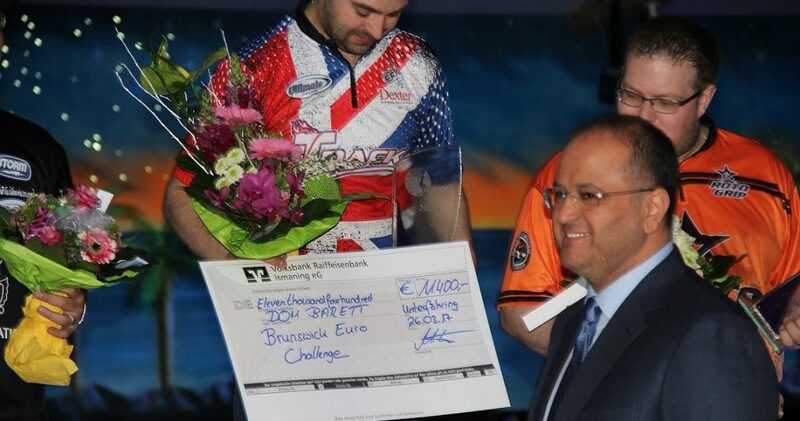 The 14th edition of the Brunswick Euro Challenge drew 380 players, 308 men and 72 women, from 37 countries. 64 players, including 11 women, survived the qualifying cut which required a 1415 six-game series or an average of 235.83 to make the top 50. While the top 12 qualifiers missed the first round, the remaining 52 players bowled six game to cut to the top 16. Anders Lousdal of Denmark led the round with 1458 (243 avg.). 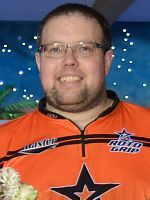 Jimmy Mortensen of Denmark, Jan Macek, Czech Republic, and former PBA Player of the Year and Team USA member, Sean Rash, brought the number of 300 game to 17. Yannaphon paced the second round with 1471 (245.17) and led the top 8 into round robin match play while Barrett made the third cut in seventh place. With the pinfall of Round 2 carried forward, Barrett won five of his even matches (30 pins bonus per win) to beat out Yannaphon for the top-seed by three pins. Williams was 80 pins behind Yannaphon but comfortable 73 pins ahead of fourth-placed Lousdal to secure the No. 3 seed. Rash ended up in fifth place, while the only woman in match play, Birgit Pöppler (left) of Germany finished in sixth place to win the women’s ranking in Munich. Carsten Warming Hansen of Denmark and last year’s runner-up Martin Larsen of Sweden finished in seventh and eighth place. 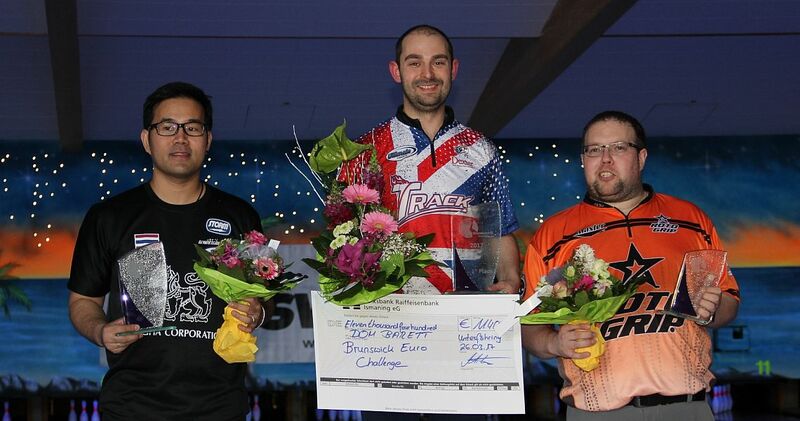 The 14th Brunswick Euro Challenge was the third stop on the 2017 European Bowling Tour and the second and last EBT “Platinum” events this season, the highest of the five EBT tournament categories (platinum, gold, silver, bronze and satellite). 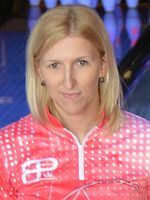 The BEC, which also kicked off the World Bowling Tour 2017, was held from March 18-26 at Dream-Bowl Palace in Unterföhring in suburban Munich, Germany, the biggest bowling center in Europe with 52 lanes. Players competed for total prize fund of 104.000 Euro with 11.400 Euro going to the winner, 8.500 Euro to the first runner-up and 5.500 Euro to the third place finisher. Low to cash was 64th place, worth 800 Euro. Women received 8 pins handicap each game (up to 292 – maximum score is 300), an equality handicap provided to women in all EBT events. The top three women after qualifying received 1.200, 700 and 500 Euro bonuses, respectively. The top 3 women after qualifying from left to right: Birgit Pöppler (2nd), Shayna Ng (1st) and Diana Zavjalova (3rd). Qualifying kicked off Saturday, March 18, and ran through Saturday, March 25. Total 64 players qualified for the finals on Sunday, March 26, including the top 50 in the overall qualifying standings, the top 5 each from a separate leaderboard of the squads conducted March 21-22 and 18-19, and the top 4 of the Desperado Squad. The top 3 players with the highest 13-game total, including bonus pins, determined the champion in a stepladder final. The No. 3 seed bowled the No. 2 seed and the winner of the semifinal match took on the No. 1 seed for the title and the 11.400 Euro top prize. The picture shows World Bowling president, Sheikh Talal from Kuwait, during the award ceremonies. Championship: No. 1 Barrett def. Yannaphon, 237-221. Top 8 from left to right: Carsten Warming Hansen, Dom Barrett, Stuart Williams, Martin Larsen, Yannaphon Larp-apharat, Birgit Pöppler, Sean Rash and Anders Lousdal. 300 games (3) – Jimmy Mortensen, Jan Macek, Sean Rash.